You may have seen in my last few vlogs that my face has decided to have a well timed stress-related breakout, leading to some very painful lumps and bumps I just ain’t got time for anymore. I did the usual routine – stripped back my skincare to the bare minimum, nourished it as best as I can, drank more water and did yoga when I could to calm myself, but my skin didn’t seem to be regenerating as quick as I’d have hoped. As you’ll see in this post, I am a chemical exfoliant kinda gal – much more gentle on the skin and they really even out any complexion woes. Buried at the back of my drawers was the La Roche Posay Effaclar Clarifying Toner/Lotion* which I didn’t realise for a while was an exfoliant, but it’s super gentle to use twice a day for getting rid of those dead skin cells and unclogging pores. I actually mix this with Tea Tree Oil so I have the added benefits of a natural antiseptic and anti-inflammatory ingredient whilst using a regular exfoliant. Together, they’re really helped refresh my complexion and leave my skin super smooth again. Yep, another exfoliant! I was hesitant for a while about using any form of exfoliant on my face, but it’s so important to help the cells regenerate which is why at the first sight of calmer skin, I popped a good layer of REN Glycolactic Radiance Renewal Mask all over just to get things started again. The marmalade texture is so comfortable and when left on you can feel it slowly working it’s way down through the dead cells and pores to really refresh the complexion. I use this about twice a week to remove blemish marks and take out any gunk that’s starting to look noticeable, and I can only rave about how fresh my skin appears afterwards – truly a natural miracle! Super Restorative Day Cream when having a hormonal breakout, but for some reason it took me a while to repurchase (mainly because it’s £70 a pot and the jar is just a nuisance, and usually I get a sample when buying other Clarins brands so okay, I’m being a stinge queen). Desperate times call for desperate measures and I picked some up on eBay (half price plus in a squeezy tube, tyvm) and it’s amazing how the smell of a product can take you back – so many memories of weekends in retail and slathering too much of this on my face. As I write this I’ve only just received it in the post so will update you on how much my skin has healed by Friday (update: my skin has completely transformed, even so far to say it’s 95% healed and looks fresher and softer than ever!) but in the past I have had painful under-skin lumps come up and within two days they have vanished – magic, just, magic. If you’re someone who wants an overnight immediate ‘wow that spot has legit disappeared from my face’ then you need this zinc cream. The Urtekram No Baby Zinc Cream* is meant for sore baby bums but zinc is incredible at killing bacteria within a spot (plus the bacteria doesn’t develop a resistance so you can use it whenever a spot or cyst appears) plus it’s anti-inflammatory properties reduce that big angry red volcano to a more even, easily covered low speed-bump. Combine that with the fact it can prevent excess sebum being produced and you’ve got yourself an instant skin miracle! Oh oils, how much do I love thee? Let me count the ways…Now that it’s been agreed worldwide that oil on oil is okay and won’t make you slicker than Danny Zuko’s fringe, all skin combos can reap the benefits of a luxury oil on the skin. I’ve been using the Green People Anti-Ageing Facial Oil* because it is packed with essential fatty acids (avocado and almond) plus vitamin E and rosehip which an absolute god send at healing blemishes and supporting the skin’s cell structure. If you’re got scars, redness that needs calming, or a complexion coming out of a warzone and in need of some R&R, the combination of natural ingredients in this little oil really works wonders at making your skin feel beyond normal again. As much as I say you need to work inside out to keep your body and skin balanced, it’s great to see those on-surface products working on troublesome areas without laying on chemicals or product upon product. 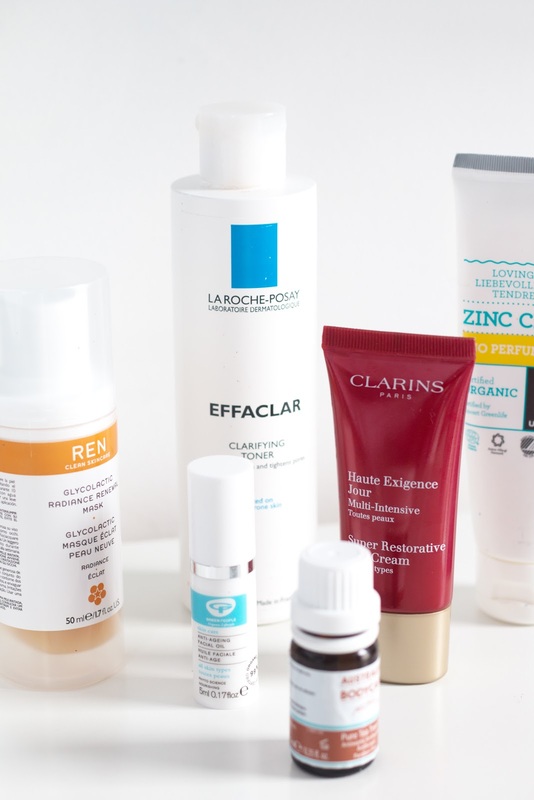 Key skincare that works is my all-time favourite, and now that I’ve got my favourites back in line, I’m pretty sure I’ll be keeping my acne breakouts stress-free and under-wraps. Have you tried any of these products before? How do you deal with spots and acne? What is your ultimate hero skincare?